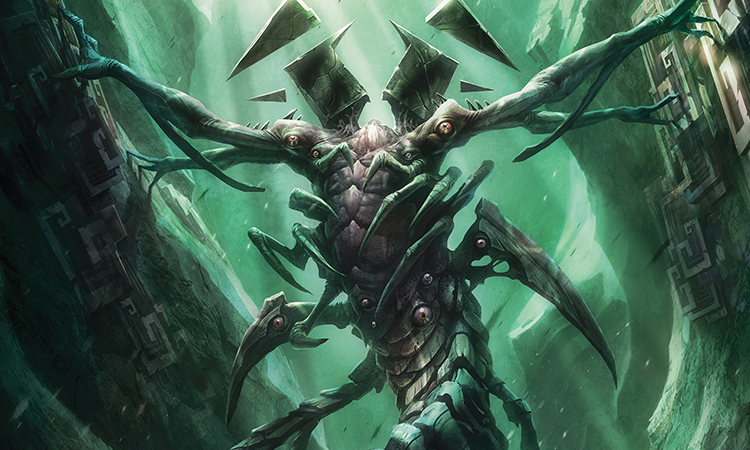 The merfolk Jori En watched from the Sea Gate's mighty wall as Kozilek rose from beneath the ground to destroy Ulamog's hedron prison. When the wall itself was destroyed, Jori was tossed into the churning sea. Jori, an accomplished ruin diver, is an expert at getting into and out of dangerous places. That may seem insignificant in the face of the raw power of the Eldrazi, but Jori's skills may prove to be critical if the Zendikari hope to survive. When Jori En came to, the stench of death was thick in the water, an ambient scent that's source was mysterious but insistent. It was hard to breathe, and Jori's gills strained to extract oxygen. Too cloudy down here. Also dark. The low pressure meant she was close to the surface. Must be night. How long had she been down here? What happened? It was suddenly harder to breathe. She would have to get out of here soon, she knew, but it wasn't the time be hasty—and therefore foolish. Self-assess. Nothing felt broken. All fingers and toes were where she left them, her left hand still gripping her spear. A good sign. Beside Jori, a warm glow bloomed in the water where she conjured a small, flickering flame at the core of a large bubble. In the light, she continued her inspection. Bruised and sore but nothing serious, she confirmed. She conjured more bubbles, each with their own inner flames, a dozen bobbing lanterns that she sent toward the surface. It was time for answers. In the bubbles' upward course they moved through increasing cloudiness, and ahead of their advance the inky blackness above began to take on dimension. The shape was too large to discern from Jori's position. A kick, and she propelled herself after her floating lights just in time to see them extinguished by a massive serpentine silhouette that broke away from the darkness to wind through the water down toward her. Eldrazi. Her whole body tensed, and her webbed hands worked frantically against the water to reverse course. The tentacle grew closer, and Jori twisted her body and kicked again to avoid it. It was much larger than she anticipated. As it passed, she raised her spear, ready to drive its point into the monster's soft flesh when the thing reoriented in the water. But it never did. Instead, the tentacle simply continued to drift in the current of the water like a colossal strand of kelp that grew down from the ocean's surface. And on it, Jori spotted suckers. This thing was not an Eldrazi, nor did it belong to one. It belonged to an octopus. A horned rift octopus, called here all the way from the Yawning Chasm off the coast of Ondu. And it was dead. She needed air. The water was too murky, too contaminated with the particles of the dead to yield what she needed. Her gills felt dirty. She wanted to open her lungs and gulp air. And the next thing she knew, she was frantically swimming along the underside of the octopus carcass in a dash to find the surface. How hard could it be? Go up. Just go up. Jori continued her desperate search, but it was so dark. Octopus gave way to kraken carcass, which became some other giant of the sea. A tangle of meat. It didn't matter what it was. To Jori, it was as though the ocean had grown a thick crust over it. With her spear, Jori probed for any space between the bodies, but something was driving the carcasses together, pressing them in on each other. Nearby, a whale's corpse began to roll. It dipped in the water, and light broke through the surface to illuminate its frame. Sunlight! The crush of organic debris began closing in immediately to stifle the affirmation of day, but Jori was already in motion. She broke the surface without grace, and she drew air into her lungs until it hurt. She held it for moment, exhaling slowly as she surveyed her surroundings. The sun was warm, but the world above the surface was as below—a patchwork of carnage, and in the heat of the day there was no respite from the stink in the open air. Toward the sea beyond the bay, the dead went on forever. But in the other direction, the carnage was abbreviated. Jori's eyes settled on the massive, ancient wall of polished white stone that rose out of the water. Or rather, what was left of it. The great lighthouse was toppled, and the wall's surface had been eroded by some geometric, iridescent blight. And all at once, disparate fragments of memory suddenly stitched together to form a terrifying tapestry. The hedron network had failed. Ulamog was free. At that thought, all Jori could see were the looming jagged shadows that adorned the space around the titan's head. Their blackness was so stark that Jori had been struck by their loudness. She had been on the mighty wall, reveling in the Zendikari victory over Ulamog and her own part in that. But it had all came apart so quickly. Kozilek had emerged, undetected, from beneath the ground. The Zendikari could do nothing but watch it happen. Gideon, Nissa, Jace—not even they could mount a defense. Even the denizens of the sea rose against Kozilek, but the titan halted them and broke their greatest champion. He broke Sea Gate, and when he did, Jori was flung into the ocean. The Eldrazi—all of this—were too much. Or perhaps she was simply too small. Here she was, just another anonymous bit in the slurry that choked the water. What was there to do now? The question weighed on her, pushing on her shoulders and tugging at her ankles. She knew the answer. It tasted bitter on her tongue. Nothing. She refused to swallow it. She couldn't. She had to let it out, so with everything she had, she screamed. She screamed until her face grew hot, until she felt the blood pump in pounding lurches across her temples, until the sound that issued from her mouth was reduced to a scratching rasp. All she had didn't seem like anything, for she felt woefully impotent. But it was not lost, because a response came. A single word fought its way across the macabre landscape to find her. That was all Jori needed to hear. The way was awkward, but Jori pressed forward in a straight path toward the source of the plea. More than once one of the great carcasses shifted, threatening to pull Jori into the suffocating crush of dead flesh, and she was forced to dash on all fours along the rolling, uneven terrain. Dangerous terrain was nothing new to Jori, who'd spent much of her life getting into and out of perilous places. It's what she did. And she was good at it. But this was different, a truth that was confirmed each time blubbery flesh gave way at the pressure of her hands and feet. Despite all the derelict temples and lost shrines she had raided, this was the only time her actions felt like a desecration. Jori climbed over a knot of lifeless tentacles. Her feet were searching for some semblance of stability on the pearlescent shell of a kraken when something latched onto her ankle. She jerked her leg back to free herself, but her balance was all wrong and she pitched forward until her helmet stopped hard against the barnacled surface of the shell. 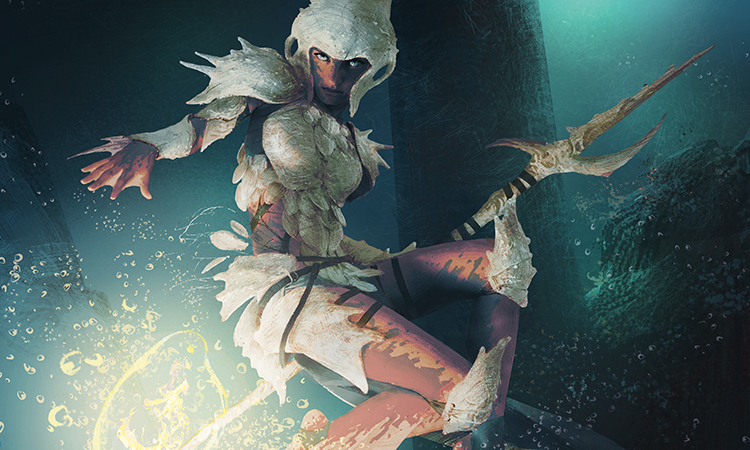 Head ringing, she spun onto her back, readying her spear to thwart a follow-up attack. But there was no attack, just a voice: "Jori." It was odd hearing her name in this surreal scenario. It seemed impossible that there could be anything familiar in all this, but then, so many things that had happened in these last few weeks seemed impossible. Jori rose on her elbows and stared down past her feet, where she saw another merfolk, blue of skin, lying in a puddle of blood that was diluted by seawater. "Kiora?" Jori asked. "Help." Her voice sounded strained, but it was strong, and to Jori, it came more as a command than a plea. Jori crawled over. Kiora's breathing was rough, and she had a bloodied hand gripped around her leg, just above the ankle, where it bent at unnatural angle. The leg was clearly broken. And badly. "What happened?" Jori asked, reaching out to move Kiora's hand aside. "Cosi won," she replied, as though it were a diagnosis of her pain. "Your leg, Kiora." Jori reached out and moved Kiora's hand aside. Kiora didn't protest. She didn't seem to notice. But Jori saw bone—the shin bone, she figured. It had split the skin when it broke, and blood oozed out in weak pulses. "We have to set this." "The bident's gone," Kiora said as she absently examined the blood on her hand. Jori had seen dozens of broken bones; it came with her field. She could handle broken bones. But Kiora was in shock, and that was much more complicated. Not that Jori could blame her, however. First things first. A splint. Jori braced her spear between two spines that rose up from the kraken's shell, and twisted until the torque snapped the spear at the midpoint. She needed a way to lash the broken spear shaft to Kiora's leg, so she unwound the leather bindings that were used to secure its tip in place. All the while, Kiora continued in her monotone delirium, "Did it abandon me? Because of Lorthos?" Jori tucked the spearhead into her belt, then placed one hand just below Kiora's knee and took hold of her leg just above the ankle. "You're going to want to hold on to something." Jori began to pull. As expected, Kiora screamed. At least she had the sense, or experience, not to jerk, Jori thought. That was a good thing. She kept pulling, and the bone began to recede into Kiora's skin. "Stay with me now. We're almost there," Jori said, more to reassure herself than anything. They had to keep going, she knew. If she let go now, the jagged edge of the bone could saw through more flesh and could easily cause irreparable damage. Kiora just gritted her teeth, inhaling and exhaling in furious succession until finally, she managed to say "Enough! It's in place." Slowly, Jori eased her grip. She reached for her splint, but before she could secure it to Kiora's leg, a cluster of green motes fluttered to life around the wound. As they buzzed along the damaged flesh, it began to close. Kiora's breathing began to slow. "I'll be fine in a moment," she said. It was the first time she seemed to be present in the conversation. The pain of setting a broken bone tended to snap people back to reality. "Bone and all?" Jori said. She leaned in close to watch Kiora's flesh knit together. "Uh-huh," Kiora said, massaging her leg. "That's quite a skill," Jori said. "I learned how to set bones from a guy in Zulaport—Old Zulaport, that is, when it was still on the coast. Anyway, the things I saw there." She bent her arm at the elbow so that her forearm dangled limply. "You wouldn't believe how much abuse the body can ta—"
"The bident's gone," Kiora interrupted. There was something in the way she said it that needled Jori's anger to life. "So you said." "And I need to get it back." "Um, I'm sorry for your loss. Really. But take a look around you, Kiora!" Jori swept her arm out in a large arc. "You'll have to excuse me if I don't give a damn about your bident." "It's the only hope we've got. You know that. When we were all at the lighthouse, you were the only one who understood its power." "And it failed," Jori said. They'd all failed. 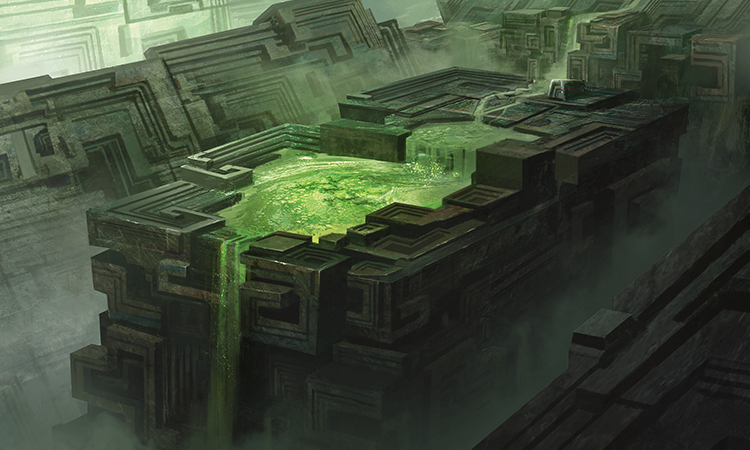 Jace and Nissa failed—Ulamog's prison reduced to a pile of derelict hedrons at the bottom of the sea. 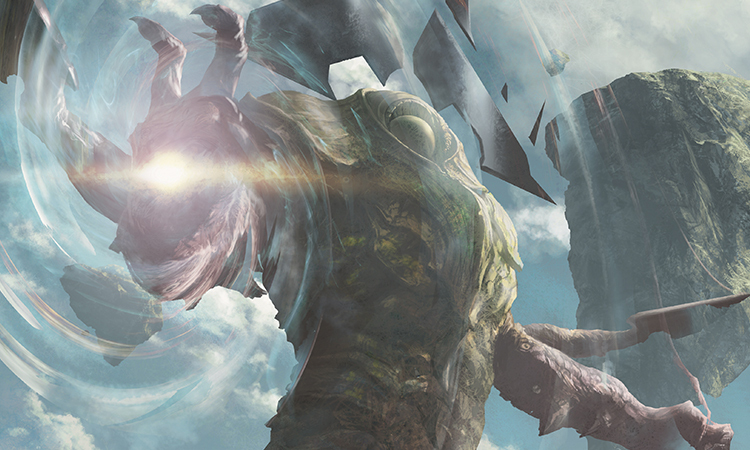 Gideon and Tazri failed—their combined forces of Zendikar scattered or dead. And Jori. What could she have done but watch from the sea wall as it happened? "Kozilek won. That's not the same thing. He freed his brother, and now they are on the loose. So what's your plan? Should we find some deep hole to hide in and wait for the end? So yeah, look around you." It was Kiora's turn indicate the surrounding carnage. "This is what's coming for all of us." A part of Jori wanted just that—to find some tiny, forgotten place of the world and simply disappear. "Jori," Kiora continued, "Kozilek's spent his trick. He's exposed. Now we just need to recover the bident. And for that, I need your help." Kiora extended a hand to Jori. Jori eyed Kiora. "Where is it?" she said after a moment. Jori trailed a bit behind Kiora as the two pushed their way downward through the water. They were swimming toward the spit of land that extended out from the coast to meet Sea Gate at one end. The Planeswalker knew the way, and she led them to a strange current that nudged them along. Jori wasn't sure how she hadn't sensed it earlier, but the closer they drew to it the more it seemed to reach out across the entire bay. It was the source of the churn on the surface. And this, Kiora had explained, was where the god-weapon went when it abandoned her. Jori didn't know why she had agreed to come along. What she did know was that it was a direction to head in. And if the bident was down there—wherever there was—it was an object that could be found and liberated. This, she understood. And when understanding was as rare as it had been lately, then that was worth something. Was it the same for Kiora? Jori watched her. She wasn't an elegant swimmer by merfolk standards. But she wasn't ungainly either. She was strong, that much was clear, but it was something else. Jori realized that she'd noticed it first when she met Kiora in the lighthouse of Sea Gate, when all of them were formulating their plan to deal with Ulamog. Certainty. All of her movements were done with certainty—even the kicking of her recently mended leg. It was the same with her words. When Kiora spoke, it was as though the conversation was already over, but she was waiting for everyone else to simply come around. For Kiora, Jori concluded, the bident was a tool for an unfinished task—to depose a god. Nothing more. Nothing less. Why did Kiora need her, then? "We're almost there," Kiora said, her eyes fixed forward. Ahead, a cliff loomed, rising sharply from the ocean floor. The current was in full force now, and it propelled them foward. "There's an opening in the cliff face. The current should carry us right to it," Kiora said. That explained the current. The seismic disruption that accompanied Kozilek's emergence must have torn a rift in the cliff. The current was pouring water somewhere, and that could explain the bident's wayward path. Kiora turned her head to face Jori. "Get ready." Jori thought she was. But then her vision suddenly became pinched, and she was looking at the submerged cliff as though it was some distant thing glimpsed through a spyglass. The current changed, too, and its course bent at odd angles, tossing the two merfolk against unseen barriers. At first Jori threw her arms out to gain some purchase in the water, or at least slow her strange momentum, but it was no use, so she tucked her limbs in keep from dislocating them. All she could do was keep her vision oriented toward the cliff. Focus was everything right now. And then, reality compressed, and everything sped up until the cliff face filled Jori's vision entirely. She was feet from the opening that Kiora described. But the way was suddenly obstructed where a segmented mass rose up from the depths. Jori first thought it to be one of Kiora's pets, but the thing unfurled to reveal a collection of limbs that reached out to span the width of the opening. Eldrazi. It wasn't a tangle of fleshy tentacles with a bony faceplate like so many of the other ones she'd faced. No, this one had shards of black glass hanging above in perfect symmetry like the titan, Kozilek. Jori hurtled toward the monster. Several limbs fanned out to intercept her, but she pushed her legs out in front of her, pushed off one of the appendages, and let the current carry her past. Kiora must have made through as well, for a flash of greenish light to the right caught Jori's eye, and she turned to see the other merfolk reaching back, her hands aglow with green energy. The energy streaked out to the Eldrazi as it turned to give chase. It lurched after them in the water, growing as it did. In a span of seconds, the monster's terrible bulk filled the opening. And then it was too great for the narrow space. It pressed against the crevasse walls until there was a sudden snap, and the integrity of the stone failed. All at once, the crevasse collapsed in on itself and the Eldrazi, just as the current carried Jori and Kiora into the unknown. "This must be how Kozilek did it," Jori said, more to herself than to Kiora. Kiora nodded. "How he remained undetected all this time?" "Yeah," whispered Jori. "Wow. From what I've heard, this cave network was pretty small, home to a handful of goblins. At least that's what the explorer Zahr Gada once told me when we were comparing maps. And now..." Jori let out a low whistle. "For something to have the power to reshape the environment like this—wow." She and Kiora were standing on an outcrop in a subterranean landscape. The flow of water that carried them through the cliff face had deposited them there, and from their position, they saw an enormous enclosed vista of angled spirals that shone with ripples of prismatic color. Jori knew these alien shapes. They belonged to Kozilek, and in spite of herself, Jori thought they might have been the most beautiful things she had ever seen. Eyes wide, she tried to take in the entirety of the space, but the sheer scale precluded such an effort. "It's unlike anything I've ever encountered," she said, but the words felt so weak compared to what she was seeing. "The bident is that way," Kiora said, pointing out across a ravine in the cave. She didn't seem impressed by this spectacle. It was just another place in the world. They picked their way around the gap, and they must have passed through several miles of caverns when Jori noted that the mark of Kozilek did not reach this deep into the cave network. The path began to narrow, and soon their path tapered into a passage that demanded Jori and Kiora crawl. "Are you sure this is the way?" asked Kiora. "Look, I'm not sure about anything. Do you still sense the bident?" "Of course I do. Nothing's changed. I just don't see how it could have come up here, where there's no water." It was getting difficult to maneuver, but Jori managed to turn around to face Kiora. "Your guess is as good as mine. Actually, it's better than mine. You're our compass. So until we get some new information, we stick to the plan and keep going." Kiora nodded, but it wasn't reassuring. Something had unsettled her. As they pushed forward, the space grew tighter. Jori halted, and began to remove her helmet and armor plates. "We're going to have to make ourselves smaller," she said, anticipating a question. She then proceeded to lash the plates together by their buckles so that they formed a bundle that she could tow behind her. She'd done this numerous times, but Kiora didn't seem to share her confidence, for Jori could hear the Planeswalker's breathing quicken. They had to keep going. Jori continued, and Kiora followed. Before long, they were on their bellies. Jori kept her torch out in front of her, and up ahead, she saw that path curved sharply upward. "Do as I do," said Jori. She rotated onto her back and worked her body into position until she was able to lift her arms up over her head. Her fingers found divots in the stone, and it was enough. She pulled herself up until her feet were underneath her. She then reached farther up, found more finger holds, and hoisted herself into the path, which veered to the left before it leveled off. She waited there for moment. "Kiora," Jori called, "I can't turn around. You can't either. You've got to keep going." "I'm right," Kiora said, pausing to catch her breath, "behind you." Jori saw the glow of Kiora's torch out of the corner of her eye. "You're doing great," Jori said, shimmying forward to make room for Kiora. "I don't know if I can do this." "You're already doing it. Right now, focus and stay calm." Jori tried to crane her neck to show that she was smiling, but Kiora didn't notice. Her face was buried in the crook of her arm. "If I had my bident, this wouldn't be a problem," Kiora said, her words muffled. "I could bring the ocean, and reshape this whole place." "It's why we're here—to recover the bident." Jori kept her voice steady. Panic was never helpful. It was the sum of helplessness, fear, and desperation, all braided together. At that moment, it was coiled around Kiora just as it had coiled around Jori out in the bay. She couldn't let it tighten around Kiora. If it did, it could wrap around her until she was paralyzed, or worse, it would snap and flail out dangerously. "Keep your eyes on me, Kiora. We're going to get to the other side of the tunnel. We'll get through this." Slowly, Jori proceeded. And slowly, Kiora followed. Ahead, the ceiling began to slope toward the ground. It wasn't much, but it didn't need to be much for the path to become impassable. Jori slid her torch out in front of her and pulled herself forward with her arms. Soon she was forced to tilt her head so that her cheek scraped the stone surface beneath her, and as she inched on, she felt the stone of the ceiling press in on her back. "Why did we stop?" Kiora asked. She was still breathing hard. "We didn't. Inches matter here." The words came out sharper than Jori intended. But she couldn't afford to be rushed. A bump protruded from the ceiling, and she struggled to find the angle that would allow her head to pass by it. Stone bit into the flesh of her ear, but she stifled a grunt to keep Kiora from succumbing to panic. One more push from her legs forced her head past the protrusion, but then she was pinched at the torso. Jori couldn't respond. She couldn't expand her lungs to find the necessary air to form words. Besides, at that moment, she had to contract, to become smaller, if only for a moment. Her fingers curled into tiny depressions in the surface of the passage, and she expelled the remaining air from her lungs. Hopefully it was enough. Her arm muscles tensed, and she strained to pull herself past the unyielding stone. She wriggled and scraped against its coarseness. Ribs compressed. Kiora was saying something, but it was all just a buzzing in her ears. "Nnngh!" Jori let out when, at last, she felt her body slide forward. Her arms tugged again, and her body was free. When her arms relaxed, she just lay there with her cheek resting on the cool stone. "...thought you were stuck," came Kiora's words as they became discernable once again. "I'm fine," Jori said as she steadied her breathing. "I just need a moment." "Jori," Kiora said after a moment had passed, her voice low, "I can't." "You have to. If we turn around now, we'd only get ourselves stuck." Jori stared into the darkness of the passage beyond the reach of her torch. Hours ago, she had watched as Kiora drove Lorthos to challenge the Eldrazi titans. She was a master of the colossal, at home among gods. And this was too much for her. There was also the added oddity that Kiora was a Planeswalker. Presumably, she could leave this world whenever she chose. But she didn't, and Jori left it at that. "Look, the bident came through here. You can sense it. Which means there's a way through. I'm going to prove it to you. But I need you to stay calm." Torch in hand, Jori began to inch forward again. This was her realm, the world of ruins and lost places. This was where she was at home. Between hurried breaths, Kiora managed, "Jori, I..."
"You're going to help me, Kiora," Jori said as she put distance between the two of them. "You have to keep track of the bident at all times. If it moves, I need to know." "It's on this level, up ahead." There was that certainty in her voice again—just a hint of it, but it was there, staving off the panic. When it came to the bident, Kiora was the expert. It was something she could focus on, something she knew. Jori continued down the passage. It remained vaguely straight, and every few feet, Jori shared the status of her progress with Kiora; in exchange, Kiora shared the status of the bident. It went on like that until Kiora's voice was only a muffled affirmation, "On this level, up ahead." And then, Kiora's message changed. "Bident's moving!" Jori pressed her ear to the ground. Through the stone, she heard skittering. Then nothing. It was close. She couldn't risk a reply to Kiora anymore. There was a good chance that whatever was scrambling around already knew she was there, but why take the chance? She doused her torch, and she had to suppress a cough as a curl of smoke tickled her throat. "Jori! Did you hear me? The bident moved—toward the surface!" Jori crept forward in silence, feeling her way in the darkness. And all the while, she could hear Kiora, whose calls became louder as each subsequent one went unanswered. At least the sound might cloak her advance. The passage angled downward, and gradually, it widened on either side. Though the ceiling still hung low overhead, Jori was able to reach the spearhead that was tucked in the bundle that trailed behind her. It wasn't a proper dagger. But this also wasn't the first time Jori had to wield it as one, and as she edged forward on her belly, the point of the blade led the way. In the utter blackness, Jori came to a place where the ground seemed to shift as she pulled herself across it, segments scraping against each other with her forward motion. There were crunching sounds where she planted her elbows. Not loose stones, Jori knew. Must be some kind of detritus. It didn't feel right. She stopped to feel out in front of her. More of the same. Then something squished when her fingertips brushed against it, and she yanked her limbs back, her stomach tightening. Going on blind like this was foolish. Better to know and be known than to stealthily sneak her way into a death trap. She whispered the flame back to life at the end of her torch, and a world of twisted iridescent shapes came into being around her. Carapace plates and shimmery skin. Limbs bent and bifurcated, bristling with sharp, obsidian-like growths. And countless lidless, staring eyes, embedded randomly in flesh. Eldrazi spawn. Jori waved her torch over this otherworldly heap that she found herself on, and the way the flickering shadows played off of it made it seem as though the whole thing was writhing. But the Eldrazi were not moving. They were all dead. The pile was higher in the middle of this chamber, and it would have touched the low ceiling, but Jori noticed the rim of a vertical chute that led up and away from here. Up. Toward the surface. The bident. "Jori!" Kiora's voice was strained. "What happened?" To Jori, the whole scene suddenly resembled the bottom half of an hourglass. Something was discarding these carcasses down here like horrible grains of sand. That could be good...or bad. Jori did her best to stay on top of the pile as she made her way toward the center. In one hand, she gripped the spearhead, and in the other, her torch. The more she progressed, the more she could make out of the vertical passage above. When she got to the peak of the heap, she rose on her knees and held the torch high so that the shadows of the vertical shaft retreated. Goblins—a lot of them—clung to the walls. One was so close that it retreated from Jori's torch. "Kiora! Trouble!" That was all Jori could manage before the first of the goblins was on her. One bounded down the cavern wall and pounced at her, driving its full weight onto her shoulders. The torch flew from her grasp as merfolk and goblin tumbled into the mass of Eldrazi dead. The goblin seemed all teeth and claws. "You can do this, Kiora," Jori yelled back through the passage. All the while, she fought to keep the goblin's bony fingers from closing around her throat. Jori twisted so that she pinned the goblin beneath her. "Control your breathing!" A terrible shriek issued from the goblin's reeking mouth, and Jori drove her small blade into its chest. "And stay calm!" As the goblin's body stopped twitching, Jori noticed that the creature lacked eyes. Dark-dwellers. They were at home down here. That didn't bode well, and the sound of scrabbling claws echoed throughout the chamber. "Kiora?" But now it was Kiora's turn to be silent. 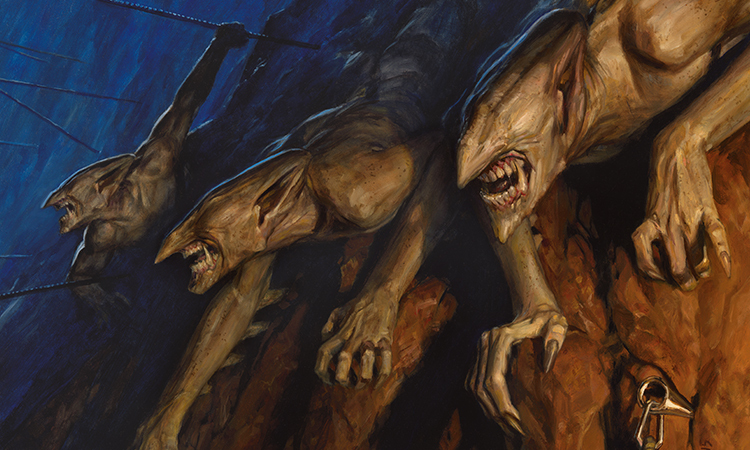 To Jori's left, the chitinous crunch of an Eldrazi carcass indicated another goblin. Jori turned to meet it with her blade, but a second goblin batted it from her grasp. For an instant, in the sputtering torchlight, Jori saw the goblins react to the blade clattering against the stone wall. They saw with sound. Not a moment passed before she wrenched her helmet from the bundle at her waist and threw it up into the goblins' passage. Like her blade, the helmet's impact rang out as it caromed off the walls, and as it did, Jori channeled mana down through her arms. She clapped her hands with all her strength, and the echo of the helmet against stone amplified, doubling up on itself until the entire chamber vibrated. Jori felt it in her chest, and she wanted to cover her ears. The goblins were thrown off balance. Some staggered on their feet, and some were scrambling clumsily back up the walls. This was her chance to escape. But to where? The room continued to shake under the onslaught of sound, and the ground itself felt unstable beneath the pile of lifeless Eldrazi. And as Jori struggled to keep her footing, she saw it. The bident—outlined in the hand of the one of the fleeing goblins. She had to finish this. She had to beat this. It was clear that she needed the bident as much as Kiora did. Jori bounded after the creature. It was still disoriented, and she caught up to it as it clung cautiously to the cavern wall. Jori jumped and grabbed hold of the goblin's foot, but it kicked out from the wall and Jori was dragged with it. They sunk into the Eldrazi muck, and then kept going. The weakened ground gave way, and suddenly the countless Eldrazi carcasses became a nightmarish quicksand. There was no correct move here, and she, the goblin, and the bident fell along with the dead spawn into the narrow chasm that had opened beneath them. Jori was aware enough to position the goblin between her and the oncoming ground, and when the ground arrived, it was with a crunch. The goblin lay motionless. And Jori had Kiora's bident. She just had to climb out of here and give it to her. "Kior—unh," she tried. It hurt more than it should have. Something's not right. She took a breath. That hurt too. Broken rib. Maybe several. Come on. She just had to get the bident to Kiora. She just had to climb out of there. From where she lay, the pit seemed vaguely conical, but it was too dark to tell. It was cramped, that much she was sure of. It would be tricky climb to the top even uninjured, but now, who could say? Jori felt tired. It washed over her suddenly and mercilessly. Her limbs were heavy, and she tasted blood in her mouth. It wasn't promising. Here she was. She had retreated into a deep hole, waiting for the end. The end wasn't what finally came down the chasm for her, though. It was a different sort of certainty. "You got the bident?" Jori coughed out an affirmation. Kiora had suffered the miniscule to reclaim her dominion over the vast. With what strength Jori could summon, she pressed the god-weapon into Kiora's hand, and smiled. Immediately, a sheath of bright blue energy formed around the bident. Kiora held it up, and a deep rumbling filled the small pit. It continued for several moments, and then she heard it—water. Rushing water. Jori was spellbound as Kiora drew the entire power of the ocean to her. "What do you say we get out of here?" Kiora said, though it wasn't a question. The roar of the water was soon joined by a series of deafening cracks that seemed to split the world. A deep, rumbling grinding followed, and the integrity of the entire cave network suddenly felt all too delicate. The sound grew closer, and Jori watched as the cavern above opened up to a torrent that cascaded toward them. This was the power of the bident, the power of a sea god. Kiora had compelled the ocean to strip the land away. Millennia of erosion unfolded in a matter of minutes. It stripped away Kozilek's mark and liberated the small spaces deep in the earth. Jori smelled salt in the air, and then the ocean water curled around the two merfolk, and carried them out with the bident.